All transactions are safe and secure with a reliable history in online purchasing behind each of our associates. Buy the I Love the Boy with the Bread Peeta t-shirt to own Hunger Games clothing and merchandise. Peeta Mellark is the male tribute from District 12. His father is a bread baker, so his family is part of the less struggling mercantile class, as indicated by Peeta's blond hair and blue eyes (a classic attribute of the class). His first encounter with Katniss occurred when she was eleven. He purposely burned bread so that it could be thrown away and given to Katniss and her starving younger sister Primrose. This Team Peeta t-shirt reveals your support for Katniss Everdeen's closest ally. 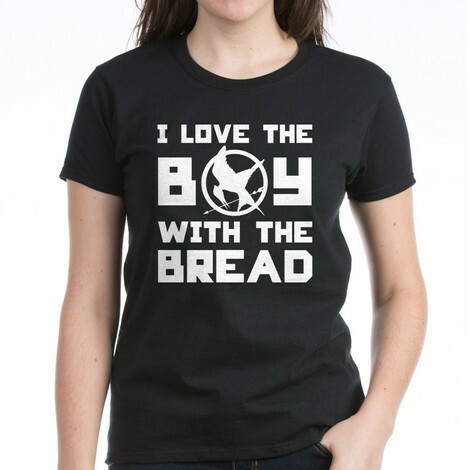 In addition to the I Love the Boy with the Bread Peeta tee above, browse the Hunger Games Clothing Gallery for more apparel like men's and women's clothes, kids shirts or hoodies.